There is also a video on Amazon Prime about this. Finally I submit for study the fact that they have found rounded roles in some of the Egyptian ruins, presumably for door hinges. These were made in a time when there were only bronze tools, which is unable to work this particular stone. "Now all matter is surrounded by light. Your scientists are beginning to suspect - and they are correct in their suspicion - that if you take light and lower or slow its vibratory frequency, it becomes gross matter. And where did that light come from? Thought, God. Whenever you contemplate thought and emotionally embrace it, the thought expands into the vibratory frequency of light. If you slow the movement of the particles of light and condense it, you create electrum, an electromagnetic field that has positive and negative poles, which you call electricity. If you slow and condense the thought still further, beyond the electromagnetic field, the electrum coagulates into gross matter. Gross matter then coagulates into the molecular and cellular structures called form. And the form is held together by the thought that the soul envisioned as an ideal of creation. All things are created by taking that which has no speed - thought - and expanding it into that which does - light - and then slowing the light down until you create this and that and all that is around you." Now I had watched this bit on the Coral Castle, and the other part about the round holes and Tiwanaku I found out about on various shows my dad and I have watched. The way Tiwanaku, the Coral Castle and even Stone Henge have been created is, quite simply, beyond the technological abilities of man at that time, as far as we know. Reading this today, I thought about the Coral Castle, and I think I know the way it was done! According to the video, the man worked on this at night. He lived alone, worked on it alone, and did not have any cranes or equipment sufficient to construct this. But as I recall, the neighbors mentioned hearing a buzzing or humming sound. I think the man somehow, through a means he either did not share for unknown reasons, or which has been suppressed by the government, found a way to raise the frequency/vibration of these stones, making them lighter and more malleable. He then used a light weight crane to precisely move each stone into place. He then lowered the frequency/vibration of each stone to its normal state. The raising and lowering of the vibration/frequency would be heard as a buzzing or humming noise. It would also explain some of the equipment they found in his workshop. Tiwanaku and even some parts of the Egyptian pyramids were made in the same way. The ability to do this was lost or suppressed some time ago, so I have no idea how the man who built the Coral Castle found it. I would love to see his library, should it remain untouched, because maybe there are books in there similar to Ramtha's White Book that teach similar things. I also have no idea why the man worked only at night and did not share his methods with anyone. It also seems as if he did not write any kind of journal or notes about the construction process. If he had, then the information is now gone, meaning the government has taken it and is suppressing it, the same as they did with Nikola Tesla's work. The ability to take a physical object, and lower or raise its vibratory frequency/rate opens up a lot of possibilities for us. You could walk through solid matter, or make solid matter permeable. You could travel faster than the speed of light, because you are no longer limited to the lower frequency/vibration of physical matter. The implications are astounding and numerous. I create this post both as a record, a way of preserving this idea should it prove to have any validity, and as a sort of community project. If enough of us figure this out and share it, if there is any government suppression, this will put an end to that. But also I am not a scientist. I have no training in that area. I am also not very familiar with the metaphysical. So I would like those who know about this in either area to come in and contribute. I would like us to figure this out together. We have the evidence of something outside what is commonly known in metaphysical and scientific arenas happening. We have texts claiming to come from entities in times past essentially saying the same thing to us. Over and over the same message comes up. I have a book from the early 1900s called Unveiled Mysteries, where an entity identifying themselves as an Ascended Master is showing a man, the author, things that show some very advanced technology in humanity's past that remains hidden and forgotten. It mentions, over 100 years before LIDAR had gone over the jungle, a vast civilization that existed in South America which we didn't even know about! So many explorers went out at the turn of the century to find advanced civilizations, and were ridiculed because all that seemed to be there were primitive tribes. But recently LIDAR technology has proved then right, and I have a book that mentions these civilizations, over a hundred years before anyone knew about it! So lets take this information, suspend our disbelief now, and try to prove its validity beyond any shadow of a doubt. Lets see if we can figure out how to lower or raise the vibration/frequency of an object. Lets test this out and share whatever it is we discover. And lets make darn sure not to let the government suppress it. P.S. If anyone lives near the Coral Castle in Florida, do you think you could get a tour of the man's home and workshop? Try your very best, and take pictures, sneakily if needed, of any books you see? If we can figure out what the man was reading when he built this, we will have a clue as to how to solve this mystery and learn this secret, by getting and reading the same books. "All of this was done in one way or another through the use of, a knowledge of, both coordination points in space (described by Seth in his own book) and the use of sound. (Also described to some degree.) There were instruments that released sound, and directed it in the same way, say, that a laser beam does with light. Drawings of some of these exist in primitive Sumerian cave renditions, but the drawings are misinterpreted, the instrument is taken for another. No one knows how to use the instruments. There are a few in existence, in your terms. I love the Corral Castle. I happened upon the story of Edward Leedskalnin some thirty years ago while researching a character for a play. What a fascinating man. I spent many long hours fascinatedly reading up on his life and his work, where I could find it. Edward built the Corral Castle, entirely by himself using the simplest of tools (a few key unique ones he fashioned himself), in tribute to the woman he loved, who left him at the altar in his homeland of Latvia when he was a young man. He was crushed and would carry the torch for her, the rest of his life, never marrying another and eventually dedicating his life to shaping the monument of his love. For a time he lost himself in books and the library, where he claims, eventually he happened upon an understanding and proclaimed to have figured out how the Egyptians were able to work stone the way they did. He moved to Canada. He contracted Tuberculosis from which he recovered, no small accomplishment in the late 1800's. Having moved to Florida and consulting survey maps, he decided upon and purchased what was considered an odd plot of land by the relal estate crowd, but it was just what Ed was seeking, a particular type of stone. He would spend the rest of his life carving and placing the monuments in his castle. He worked by himself usually by night, always spurring any offers of assistance, and was a distinct oddity to his neighbors. The gate to his castle weighs several tons and was so perfectly balanced on the post which ran through it's core, that a young girl could open it with one hand. Several times Edward was approached by the Army Corp of Engineers, inquiring as to his methods for moving massive stones by himself, a diminutive man of 100=110 lbs, with minimal tools. One time, he was beaten and hospitalized, but recovered and never shared his methods. When the bearings in his main gate doorway needed replacing. The Army Corp of Engineers arrived with a team of engineers and a full spec of construction gear. They were able to rehang the door with considerable difficulty on its pivot with new bearings, but those with experience at the castle claim it has never worked as smoothly as the original hang. Partially through his construction, Edward soured on its location and decided to move it all some 10-20 miles away to another site. Neighbors reported offering to help load massive stones when they sat near his truck, during the move. He always refused any aid and the following morning, the neihbors would scratch their heads as the massive stones would be loaded in the truck overnight. He wrote a paper on magnetism, which I could not comprehend, but it seemed central to his process. I read and reread it dozens of times. It's just beyond me. I have a theory that magnetic fielding of the earth is unique to each meter, the magnetically sensitive gland in the brain of a salmon allows it to follow the current or flow of magnetism to its birth place, because of this unique 'magnetic fingerprint'. So if one can find this frequency, could it be possible to generate a magnetic resonance of a stone to cause its polarity to match that of the local earth field, causing the same bouyant resistance that we use to float massive trains on magnetic cushions and levitate along the tracks when they weigh millions of tons? Such a joy to ruminate on this stuff. I'm so grateful to Ed and his dedication to expressing himself so monumentally, mysteriously and privately, simultaneously. Here's a picture of the 'magnetic current' tool he fashioned for his work. Its entire structure is like an altar piece of sacred geometry. I may have that paper on magnetism in my old files. I'll root around and see if it's here if you're interested in giving it a go. This would definitely be another possibility to consider, that of finding whatever the opposite of gravity is, harnessing and using that. I have thought about that subject a lot myself. Odd that a man (me) with limited scientific understanding would find things like antigtavity so fascinating, to the point that one of my dreams is to have a workshop where I could build an antigravity car. I have no idea where this comes from, and I am afraid that the call to this will remain unanswered. In any case, yes, if you could find a way to reverse the pull of gravity on an object you could move it. However that still leaves the mystery of how the Tiwanaku stones, and the rounded holes in some of the pyramid stones, and possibly whatever hole existed in the Coral Castle gate stone, were made. Thinking about this some more I thought of density of matter. You could have a granite cube, a wood cube of the same size, a plastic cube the same size, and a foam cube the same size. Obviously the foam will be the lightest and easiest to cut. If a process was used that raised the frequency/vibration of an object, perhaps it was raised to something more like plastic, wood or modeling clay, lighter and easier to cut? It would be nice to know what books exactly E.L. was reading. Here is Ed using his ' magic light magnetic gross physical manifestation technology to build Coral castle . Did you know that a lot of stone , especially limestones , are fairly soft when quarried and dressed and then over time they harden ? Would you like to see some of the tools and the techniques the Egyptians used to make holes in hard stone ? They left records of it, ya know . . . . the technique and the tools . Or you could just ignore all that and carry on with this 'great mystery' . Ahh Nungali! I miss the bitter taste of your acerbic wit... I was just thinking about you a month or so ago. Glad to see you still here, still active! Now this last video even pushes my credulity I admit. It's from a very strange YouTube channel and I am still investigating. But the principle is solid enough. All physical mass on earth, when you get down to a microscopic level, is space and vibration (we have talked about this before.) Everything operates at a certain frequency or vibration. If this is changed, you are no longer constrained by the constraints of the physical world, as you are no longer operating on that frequency. Is it too great a stretch of the scientific mind to say that all physical matter is really just light, operating at a lower frequency or vibration? P.S. One last thing... How do you think the Egyptians moved this, from their quarry location, to where they erected it, and how do you think they erected it? The crane you see there is too weak to support the physical weight and mass of the stones. WHAT CRANE ? iTS A TRIPOD WITH VERY HEAVY DUTY BLOCK AND TACKLE AND VERY THICK TRIPOD LEGS - LOOK AT THE THICKNESS AND ANGLE OF THE LOGS FORMING THE TRIPOD, NOW LOOK AT THE BLOCK UNDERNEATH. HOW DO YOU THINK THEY USED TO BUILD CATHEDRALS IN GOTHIC TIMES? eD'S BLOCKS WHERE NOT THAT HUGE AND MOST OF THEM WHERE EASY TO CUT LIGHTWEIGHT 'CORAL' . SO, WHAT IS THE GENIUS ED DOING HERE ^ PULLING ON THAT CHAIN , DISCOVERING THAT THE LOAD IS TOO GREAT FOR HIS RIG ? IF YOU CANT TELL THE DIFFERENCE BETWEEN A CRANE AND A TRIPOD, ARE YOU REALLY ABLE TO TELL THAT THE SET UP WILL NOT LIFT THE BLOCK UNDERNEATH IT . AND IF IT CANT WHY DID ED BOTHER TO SET IT UP ? UMMMM ... HOW DID THAT DEMONSTRATE THAT ED'S RIG COULD NOT LIFT THE BLOCK ? Now this last video even pushes my credulity I admit. OH ? I HAD NOT REALISED YOU HAD ANY OF THAT LEFT . (we have talked about this before.) Everything operates at a certain frequency or vibration. HOWEVER... EXTREMES OF TEMPERATURE AND GRAVITY CAN CHANGE MUNDANE PHYSICAL RESTRAINTS - HENCE THE QUANTUM WORLD , SO IN THAT AREA ONE COULD SAY YOU ARE RIGHT . BUT CERTAINLY NOT ANY CHANGE IN FREQUENCY. THE 'RULES' ALSO CHANGE IN THAT STRANGE REALM OF 'SIZE' - THAT IS, ON THE SUB-ATOMIC LEVEL . BUT IS THE SUB-ATOMIC LEVEL THE LEVEL OF THE 'PHYSICAL WORLD' ? Now,how did the Egyptians move large blocks of stone ? Simple, by dragging them. On sleds over ground or on wooden rails with rollers. The greater distances where moved on the Nile River. by boat. We have pictures from the Egyptians, we have archaeology showing the evidence and we have ,recently, a diary found of a person that did all this . Really, if you spent more time reading up on actual stuff, instead of internet woo-woo, you would already know all this. you make a big sand hill and dig a hole in the middle, it has a slope down one side and wooden rails, the obelisk, is moved up the hill and over the hole until its weight tilts it, then it slides down into the hole, nearly erect. Then some adjustments are made to make it upright . Then you dig the hill away. Simple ! You where thinking they had to lift the big block lintel UP and onto the uprights, weren't ya ? you make an extra big hill with TWO holes in it. You drag and drop two blocks vertically into the holes so they come up to the top of the hill surface, you drag another block over them to rest on the two uprights, you dig away the hill to leave the stones standing. Simple . I am sure we did this before ? Its another obvious solution . If you exercise your brain more you might find it easier to break out the box that imprisons it . I did cycle away as planned, and was gone for a few weeks. I made it to Parkdale, WA., then realized I was done. Or at least that is what I tell myself. Maybe I did just give up. But I remember a sort of feeling that I had done whatever it was I had set out to do, although I do not know specifically what that was. So I haven't made it to California - yet. You have posted a reasonable counter-theory to what I have proposed and I will accept it for now. The simplest solution is sometimes the best. But I feel that you are resistant to all outside-physical phenomena or solutions. That is the sense I get - how you come across to me. In essence if you can't see, taste, hear, touch, smell or measure it in some way it doesn't exist for you. I can't recall much from our earlier conversations of your particular mindset. So if I have this wrong I apologize. It is just what I feel or sense coming from you. Hundreds of years ago, when a man decided he wanted to get a good look at the stars and the moon, and he could create a device that would allow him to do so, I am sure many of his peers responded to his aspirations the same way you have responded to me. Yet Galileo went on to make a telescope. Nikola Tesla thought of wireless energy, Edison thought of the light bulb. Somewhere along the line someone thought they could create a craft that would take men into space. Imagine how this idea came across to people in Victorian times when Jules Verne wrote From The Earth To The Moon! All wild theories and fantastical ideas are the forerunners of new discoveries. All the science I presume you adhere too has been developed on this sort of foundation. Men looking beyond what is known, what is perceivable using the five senses, and bringing back from the ether an idea that, later, concreteized into reality. Your five sense only know and understand a fraction of the world around you, and even of that fraction you know only a tiny little bit. If you have never lived in the Amazon you have no experience of all the things there, and the same if you have never lived in the Arctic. All the things you know, that you are certain about, that you have experience with, that, in your mind are proven facts, are still subjective to your experience. Someone else with the same material may see the same things completely differently. I am sure you know all of this already Nungali. So do yourself, me and the rest of us a favor and don't laugh when someone says that sound could create a portal to another world, or be used to make a physical object lighter and more malleable. You have no way of knowing that you are 100% correct. You have no way of knowing the technologies and methods that ancient civilizations used hundreds, thousands or ten thousand years ago. In fact, unless you are an archaeologist, you only know what you know 2nd or 3rd hand at best. Until you are running around the Amazon, digging up ancient civilizations, you are simply believing the facts as relayed to you. You have no knowing based on experience. I would never claim that something is not possible - something maybe you see as a weakness. But maybe it is a strength. Maybe, just maybe, proclaiming something is not possible without any personal knowledge based on experience backing it up, is extremely shortsighted, and not very in tune with the scientific method of not dismissing any possibility until it has been well and thoroughly tested. And I have proof, in the form of a channeled text over 100 years old, that there things from ancient times which have been hidden from us, because we are not ready for them. Buy a copy of Unveiled Mysteries and read it. Then do some looking around YouTube for what they have only recently discovered using LIDAR. The author of this book is talking about things we knew nothing about back then, which have recently proven to be true. Oh and the people who went off into the jungle at the turn of the 1900s, some of them never to return, were laughed at too when they proclaimed they were looking for ancient civilizations, when all that was known at the time was that primitive tribes lived there. Yet now we know they were right. Maybe my mind is too open, and maybe yours is too closed. I think we could both benefit from changing our minds. And if I have you completely wrong I apologize. Trying not to assume anything, just expressing my feelings and thoughts. I mean no offense. I know I am criticizing here and I am sorry. Trying to practice being non-critical and non-judgmental of others and myself. I am still learning. I have a lot of work to do. P.S. As I shut down my computer I thought about what I had read in, "Autobiography of a Yogi." I am sure you are familiar with this text. How do you explain that account of that master who bi-located - was both at the temple and meeting the man coming to visit. This is something I assume not thought to be possible in science, and it would seem impossible to any skeptic. How do you handle an account like this? P.P.S. I called it a crane, but yes, it is a tripod. Also no, those blocks are not light at all. The tripod couldn't have moved them, but I'll accept that maybe he used it to pivot and stand the blocks using the technique you mentioned, or something similar. However, it still doesn't explain how he loaded up his truck when he moved the blocks to a new location, nor how he moved them from wherever he quarried them. P.P.P.S. You have inspired me to create a new saying! Thank you! I didn't know you went on a bike sabbatical mate! Good on ya! I used to put about 4,500 miles a year on my bike. Camped all over the midwest throughout my teens and twenties using my bike. Biked all year round in Minnesota, even managed to make a functional metal stud tires for Winter riding. Ok, as for Ed and stones and what ifs... I've always loved a long deep conversation about what if's. It's one of the few passtimes that still engages me, while most others have lost all gravity to draw me in. I'm not bothered by questions without firm answers and as I don't believe everything I think, or hear, I enjoy thinking, listening and ruminating on many things that some parts of my own mind, society at large and even family/friends don't like to engage in. Always have preferred a good unfolding question, to a pat firm answer. This questioning drew me to my path, over the last few years the reason why some of my teachers offered serious warnings about entering the path have become evident. It is rather shattering to steadily and relentlessly have all notions one thought to be unchangeable certainties, once rock solid foundations for interacting with life, dissolve like fog. Of course, there seems to be nothing solid about rock. Physics has been comfortable talking about this for over a century now. It's all a matter of frequency, resonance and vibration. Tesla comes to mind as a resonant author on the subject. The Tibetans are noted to have been using acoustic levitation in the buidling of shrines on cliffsides. Here in the west we're now using standing sound waves to float tiny needles along channels. Magnetism is used to levitate thousands of tons of train along tracks at moderate speed. I love Nunners. He's a friend. I don't mind, nor am I surpristed he finds our conversation about the possibilites of Ed absurd and ridiculous. I am ridiculous. I remind myself (as does my wife and close friends). I welcome the voice of certainty, even when i can't share it. Fortunately, I don't believe everything I think. I do still like to play with thinking a bit though. Some time ago this notion arose in awareness. "just because you thought it creighton, doesn't make it real, true, or even important. it's just a thought... you have 50,000 a day, don't believe everything you think." They're just thoughts, have fun with them once in a while. So few pleasantries left in the process. Still tend to believe what I taste, smell and touch. But given the way my path has been unfolding these last few years... my gal has watched in dismay and love as I've slowly dissolved from the man she married to the fluid, amorphous field of awareness I'm unfolding into... nothing much surprises my close friends when it comes to unexpected things coming from my face hole. So here's some more fun from my headspace to yours. Here's an article related to what Swedish Dr Jarl observed regarding Tibetan Acoustic Levitation practices in the creation of shrines high up on cliffsides back in the 1940's. This report from civil engineer and flight manager, Henry Kjelson and a similar one by engineer Olaf Alexanderson describe this acoustic levitation phenomenon in the publication. Implosion No. 13. They relate to observations made by Dr Jarl. A friend of theirs who while attending Oxford, befriended a Tibetan Monk, who in 1939, implored Dr Jarl to travel to Tibet to help treat a high Lama who was ill. While there, Dr Jarl witnessed and later would return and film the process of Tibetan monks levitating large stones up a cliff side using acoustics. The film of course is in the possession of the Royal Science Academy vaults, but the conversations remain. Fun stuff. Glad you brought it up, haven't had a nice bone to chew in a long while. 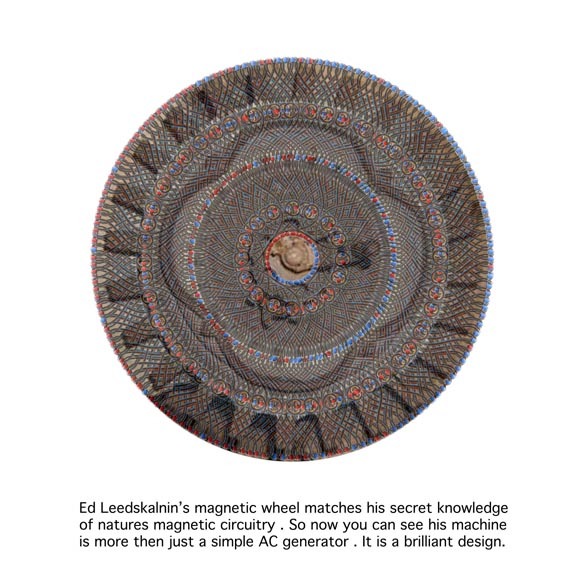 Edit to add: The first part of this blog post is a repeat of the Tibetan article, but in the second half, he delves into Ed's work with magnetism and his own exploration of electricity. While this article deals solely and more indepth with Ed's exploration of the current of magnetic flow and electricity. Fascinating reads. Good for you ! - you should have cycled to Coral Castle and checked it out . Are you still in Parkdale ? But I feel that you are resistant to all outside-physical phenomena or solutions. That is the sense I get - how you come across to me. In essence if you can't see, taste, hear, touch, smell or measure it in some way it doesn't exist for you. I can't recall much from our earlier conversations of your particular mindset. So if I have this wrong I apologize. It is just what I feel or sense coming from you. Nah ! I am the guy that looks through the telescope ... I wanna see for myself ! I would probably want to make one and experiment . I am also the guy that would have poo-pooed those that said if I look through the telescope I might be sinning and not believing what the church told me . Interesting that you should use THIS example as those people ^ where the ones I studied most , like Ficino and Bruno .... I was particularly taken by Ficino's 'star magic' ... look them up . All (valid ) hermetic studies should include these people . So ... you dead wrong on that one . All wild theories and fantastical ideas are the forerunners of new discoveries. No they are not ! Come on now ... ALL WILD IDEAS ? ? ? . Thats a blatant exaggeration ! All the science I presume you adhere too has been developed on this sort of foundation. Men looking beyond what is known, what is perceivable using the five senses, and bringing back from the ether an idea that, later, concreteized into reality. and on that note I suggest you read Ch 1 of this, is short, easy to navigate and full of sooo many explanations to make all of this fit together ; that is , how these ways of thinking led to, eventually modern science and what new discoveries changed the way we thought, to either develop the good ideas or throw out the bad ones. It tracks the consciousness changes from 1300 to 1800, a crucial period, in the transition from the 'magical mind' to the 'scientific analytical mind' (collectively) in western society . I am not ignorant on this stuff . You must have forgotten I am a practising hermticist ? I am sure you know all of this already Nungali. Yee -eees . But you probably had fun writing it . So do yourself, me and the rest of us a favor and don't laugh when someone says that sound could create a portal to another world, or be used to make a physical object lighter and more malleable. You have no way of knowing that you are 100% correct. You have no way of knowing the technologies and methods that ancient civilizations used hundreds, thousands or ten thousand years ago. In fact, unless you are an archaeologist, you only know what you know 2nd or 3rd hand at best. Until you are running around the Amazon, digging up ancient civilizations, you are simply believing the facts as relayed to you. You have no knowing based on experience. Ummm .... I did study certain subjects at Uni, including Cultural Anthropology, which I still study . And the above REMINDER should indicate my knowledge IS based on experience . Now, tell me Dream Bliss, what depth is your knoweldge and assertions based on, what have you studied , what have you dug up , what have you re searched and cross referenced ? What a tac to take on me ! It actually applies to YOU not me . I would never claim that something is not possible - something maybe you see as a weakness. But maybe it is a strength. Look, I am not saying THAT isnt impossible, I am actually criticising a whole range of things in your post , that particular one is rather 'indeterminate' , but the others are not in the same category. It is disingenuous to criticise me about things being possible when I am also talking about moving and cutting large stones and not solely that sound can cancel gravity . I can post vids here of little things, under extreme conditions ( eg temperature) appears to do so , but that is with VERY advanced complex modern day tech . Maybe, just maybe, proclaiming something is not possible without any personal knowledge based on experience backing it up, is extremely shortsighted, and not very in tune with the scientific method of not dismissing any possibility until it has been well and thoroughly tested. Do you think it has not been tested ? All srts of these ideas have been tested ... and failed ... but even then the 'believers' still carry on like it didnt happen ! The cutting of stone (postulated by woo-woo) with laser like sunbeams reflected off golden mirrors didnt work one bit ... he managed to singe some paper and felt good about that ... there is lots f these failed attemots filmed on youtube , go have look. Now you show me one of these wacky experiments that worked ! And I have proof, in the form of a channeled text over 100 years old, that there things from ancient times which have been hidden from us, because we are not ready for them. This is why you will never 'get me' .. until you begin to suspect that mere 'chanelled information' is not 'proof' at all ! How did you develop such judgements and evaluations . Who you going to believe ? ... what you want to believe I suspect . Buy a copy of Unveiled Mysteries and read it. I have a huge library full of such books, been reading them for over 40 years . Look , I can even understand this text and think, though very obscure for the 'uninitiate' holds a wealth of useful applicable info, even in today's world . But if you dont study all the relevant materials, to cross reference and understand what is being said , its gobbledegook . The part on Hermanubas / cynocephalus is the bit I referring to (and by his reaction, the reader 'gets it' to . Then do some looking around YouTube for what they have only recently discovered using LIDAR. I have seen many LIDAR results , no half descent cultural anthropologist would be unaware of it, and incorporate its results ... heck I even cited its results at Cadiz in the Atlantis thread here. Cool stuff eh ? Its expanded our knowledge . Are you referring to something specific found with LIDAR that backs up your specific claims with this ? The author of this book is talking about things we knew nothing about back then, which have recently proven to be true. Oh and the people who went off into the jungle at the turn of the 1900s, some of them never to return, were laughed at too when they proclaimed they were looking for ancient civilizations, when all that was known at the time was that primitive tribes lived there. Yet now we know they were right. You mean in the Amazon ? Yes, thats right, and it goes to show some very interesting things, that people can loose civilisation and revert to forest dwellers and H&G lifestyles. Most scientists where laughed at when they happened upon new stuff. But some people crow and postulate about really silly stuff, for years on end, with no result or no back up evidence of any kind, or even wrongly and dishonest stuff, the woo woo subjects are FULL of that . I will expose that stuff if I can. However 'Unveiled Mysteries' is too vague, there are many texts termed that . Maybe being open isnt the issue? Maybe its the evaluation process once things get 'in' through the opening . What I am 'closed' to I was 'open to' I evaluated it and it didnt pass. Also, in my life, I have evaluated things I didnt believe in one bit, and they passed . I wa still suss, then I saw the evidence ! But sometimes (and in these cases) the evidence manifested in other ways that I was (not) believing in . ... hmmm , maybe I made a mess of that . I will give an example . My indigenous shamnic teacher warned me, on a walk through a particular area of relative wilderness to be mindful of Law " There are forces out here that will rip the head off your shoulders if you are not ! " he seemed serious but I was (internally) ... meh . But I was assuming what he meant and how that would happen , I realised later he never said HOW that could happen . Trees where snapped off and gone, some where uprooted and gone, but some others, big and small where snapped off 1 -2 meters above ground and rest intact, tops gone, it totally removed his orchid, a branch was speared through a tree trunk, his house was twisted at 45 degrees with one corner on the ground and the other, with foundation stump still attached 2 meters in the air, the path went up to a hill and then it must have gone airborne, the top f the hill was stripped of vegetation and now flat. he said he got a new top paddock. Fortunately, a bunch of mates, a couple of tractors and some chains and careful manipulation got the house back on the ground and flat. Now I believe my teacher abut that ! My problem was my stuff, what I was putting into it. Now I believe him ! But not in the way I thought I didnt believe - like the guy that said he believed in God and responded to someone when they said they didnt believe in some silly lone God sitting up in the sky watching us so he was an atheist, he responded " Well, I dont believe in the sort of God you dont believe in either ." And if I have you completely wrong I apologize. Sokay ... happens all the time , just cause I am a long term practising magician doesnt mean I dont have discernment (a lot dont, thats why they so nutty or get such a bad rap ) and just because I do, doesnt mean I am a materialistic skeptic . But ...... have I got you wrong ? Trying not to assume anything, just expressing my feelings and thoughts. I mean no offense. I know I am criticizing here and I am sorry. Trying to practice being non-critical and non-judgmental of others and myself. I am still learning. I have a lot of work to do. By doing what you are doing you WILL learn , its just a bit harder and more challenging . You know I used to LOVE the ideas presented by Von Danniken and the same ilk back then ... yes, I had 'emotive attachment' to get over . I went through all the usual stages . I dot mind a challenge and good questions at all , that;s how I learnt a lot of this stuff . I think you just need to practice what you should do with ideas once you are open to them and allow them in , you need to be aware of a 4 fold discernment practice . MAGIC ! But he didnt change gravity by sound, did he ? One answer for one subject of discussion, one for another subject of discussion, you are miking it all up together . But if you like we could look at and analyse this particular case and I could offer some observations and explanations . Cough up then, give me the same evidence and stats on this you require from me .
" For decades, the park featured a perfectly balanced stone gate that, despite its weight, would easily swing open with a strong breeze or the push of a finger. How it worked remained a mystery until 1986 when it stopped moving. When the gate was removed it was revealed that it rotated on a metal shaft and rested on a truck bearing.
" But Leedskalnin worked alone using basic tools like picks, winches, ropes and pulleys. Leedskalnin himself said that that he did it using hard work and the principles of leverage. The tools he used to quarry the rock are on display at the Coral Castle, and several old photos depict the large tripods, pulleys, and winches he used to move the blocks. Though the quarried stone slabs are large, they are actually lighter than they appear because the rock is porous. "Though Leedskalnin worked alone, he was not a reclusive hermit; he had friends who he saw often. One man, Orval Irwin, was not only a long-time friend of Leedskalnin's but also a building contractor with a deep knowledge of construction techniques. Irwin wrote a 1996 book with the inspiring title "Mr. Can't Is Dead! The Story of the Coral Castle," and in it he explains, through photographs, drawings, and schematics, how it was done.
" Irwin pours cold water on the paranormal theories that unknown energies, alien technology, or levitation built the castle. In fact, he finds such theories an insult to the hard work and integrity of his friend: "Back in the days when Ed started carving out his original stones," Irwin writes, "his was a generation who knew accomplishments by the sweat of the brow. It wasn't mysticism but hard work, this is how Ed really accomplished the massive project...."
AND look at 5:11 ! Ed said he knew how ancient Egyptians did it, yes, THIS is how they did it ! And people say you cant cut stone with a saw . Even using the chainsaw mechanism shown can be done VERY slowly (yet watch how slow Ed's processes were ) with a rope (chain) and a stone grit harder then the stone being cut ( the hardened metal teeth equivalent on the chain saw or 'diamond saw' . His method f rollers is the same for moving the blocks too - see "Merer's Diary' link above, and 'Mere's Boat' related documentary where they show the archaeology of the rollers and and try out the process. So, you dont know from where he quarried them from . A discerning person would would find that out before they engaged in any wild speculation about that . As far as loading the truck, maybe he used his block and tackle and dragged them up a ramp with rollers on it ? That would seem simple and effective, each process ; block and tackle, ram and rollers, each decreases the load . By the way, I am not dissing Ed, he was amazing and did discover amazing answer to 'mysteries' it is a shame what people loaded on him posthumously ... its a VERY similar story with the ancient Egyptians . Well ..... are you going to say you creation ? As my very Germanic wife used to say to me "You cluck ? So ... you should lay the egg then ! " And thank you for answering so many issues and questions I posed. many people cant seem to follow me or ignore questions . Thing is, I can post stuff here like this, showing the debunking of woo .. seasy on an internet forum. Its harder to show the real magic I have discovered and how it actually manifests , or how a full blown magical ritual can operate and work ... and SHOW the result ... ya gotta be there ! You'all come on down here some time ... in your life . Liked ya post spec the bit : " Fortunately, I don't believe everything I think. I do still like to play with thinking a bit though." maybe I am the opposite ; I have a range of beliefs, but I dont assert them as 'what I THINK ... to be 'true' . Eg, 'religious beliefs and afterlife' I aspire to my indigenous shamanic beliefs ....now, at this stage of my life . But if someone asked me what I THINK will happen when I die ? : dunno .... I might express what I 'hope' or have 'come to realise as possible' or even state some 'facts' - qualified by my 'wants' - like retuning my composing elements to 'M other' ( nature ) . But maybe we are saying the same thing ? I used to do it with water droplets in my Tibetan singing bowl . to sum up, and its all really about one question that I was challenged on ; although I do see that in some cases ( very small objects with brand new super modern complex technologies ) we can levitate by sound , it is NOT demonstrated that Ed did this in building Coral Castle and it appears it IS demonstrated how he actually did build it . It just got obscured by latter woo woo peeps . well... so much for my plans this afternoon. Dont bother , unless its a very good one , old, well made and from electrum. Otherwise hard to get a good result ( fountain ) , you just get splashy . . It doesnt actually 'levitate' droplets as you can see , they are jumping up and then falling straight back down , it more of a 'vibrational boil ' . Thank you for sharing that information on the levitating stone. There is a lot here to respond to... For now I am just going to retract any criticisms and judgments I have made towards you. It seems as if I am wrong. I guess I tend towards more magical thinking because my life has been anything but magical. Gurus, masters and teachers might point out that life itself is magical, the human body, the other lifeforms with which we share this planet, the planet and the universe itself. But, for me, that isn't really magic. For me perhaps magic is something more,, which, if I could ever find it and learn how to use it, would make my life less mundane. In other words, sure I could drive a car or ride in an airplane. But I would much rather levitate, fly or transport myself instantly wherever I wish to go. Not sure where this desire comes from but it is deep in me. So I guess that is why I look at these mysteries things when I come across them with wide eyes and some strange thing like hope because maybe, just maybe, life is more than this. More than this giant ball of crap in and on which I have been forced to live. Yet the gurus, masters and teachers would tell me that I have to see this as more than enough. Easy for them to say! I am unhappy with my life. In fact, I will go so far as to publicly say that I do not have a life I want to live. I am discontent with things as they are, I feel unfulfilled. I know these things will have to be addressed, and I don't care to address them. Have nothing that makes me want to care to. So I guess that's why I have been the way I am. But I guess it's stupid to have such hope for magic, for something more, because even if it did exist, it is unlikely I would ever find it, much less learn how to use it. I think I feel sorta like that character in the animated series Dragon Price. Feeling that magic is what he is supposed to do, but being born human, without it, without whatever is needed inside to perform it. Correlating what I had read in this book, which was published nearly 100 years before! This still excites me, to actually be able to verify something said in a channeled text like this. I don't think I really needed the proof, but it's nice to have some evidence that what I am reading about, such fantastical and (dare I say) magical things, may actually be true! But is't not really magic at all, just ancient technologies, ancient knowledge, we do not yet have. Still that doesn't make it any less amazing and important to me! OK, I am done for now. I need to go through all these things and read over everything some more. Girl found in cave ^ ..... let's put a red circle around the girl - yep, thats the girl they are referring to, that one ... the one there in the cave , see ... she got a red circle around her , that one there . Ha! Okay, you cant have written that in the time between I said where is that little fox . You posted JUST as I wrote that . But now you know how Coral Castle was built ! Then, if you dont care to address it, there you will stay . What do you think made you care so little about your own happiness and life fulfilment ? I dont get how someone could feel bad the way you do and 'not care to' try and change it . I dont think you are stupid . You are at least receptive to some facts and demonstrations about things you are strongly emotionally attached to. Not many people could do that, they would still be arguing and putting up silly things about Ed's ability to levitate the stones of Coral castle in place . I see an intelligent quality in there that could be harnessed for your benefit ad clarity about things . The names of John Lloyd Stephens and Frederick Catherwood are forever linked to the Maya and Mayan studies as the two great explorers who documented the ruins from Copan in the south to Chichen Itza in the north. The stories told by Stephens in his Incidents of Travel in Central America, Chiapas and Yucatan (1841) and Incidents of Travel in Yucatan (1843) complemented by Catherwood's illustrations, focused international attention on the Maya civilization. Catherwood's publication of his book of lithographs Views of Ancient Monuments in Central America, Chiapas and Yucatan (1844) furthered the world-wide interest and lifted the Maya civilization out of obscurity and into world consciousness. ie. the Mayan 'lost civilisations' where known about long before this scammer wrote about them. If you pay careful attention to the video you posted you will see that those ruins of that civilisation where already evident and the LIDAR did not find it, it just revealed its greater extent than any visual remains did . Unveiled Mysteries describes an encounter with St. Germain (see also The Comte de Saint Germain), here described as an Ascended Master, virtually a God, and able to manipulate the fabric of reality. Ballard describes a series of astral trips in time and space with St. Germain, to lost civilizations in South America and the Sahara, as well as well-stocked bunkers of the ancients in the Grand Tetons, Yellowstone, and Mount Shasta. Ballard and St. Germain revisit past lives as citizens of Atlantis and Mu, and they turn out to be relatives. A final chapter mentions encounters with entities from Venus, a theme of later UFO cargo-cults of the 1950s. Connoisseurs of this genre will appreciate Unveiled Mysteries . The book is written in a breathless style with a more than liberal amount of em-dashes, Inappropriate Capitalization, and melodramatic plot-points which resemble golden-age pulp sci-fi. There are incoherent, surreal rants which would not be out of place at a Church of the Subgenius rally. One notable successor of the "I AM" Activity is the Church Universal and Triumphant of Elizabeth Clare Prophet, which also reveres St. Germain, and also attempted to hole up in the Rocky Mountain area in the 1980s against the threat of nuclear war. " Just gonna respond to this for now... It's called Apathy. I need to clarify myself about this as you have me wrong. But I just don't want to do it right now. Do you know/have these books? The first one contains detailed instructions how to construct a magnetism-based device. The second one provides some background info; it's rather esoteric in nature and would be no easy read for most. Anyway, I consider both essential reading when it comes to Leedskalnin. Regarding anti-gravity and closely related topics in general, do you know Tim Ventura's awesome website already? Folks may enjoy this gentleman's take on Ed's work.